Last week I had the chance to give a talk at Barcelona Unseminar in Bioinformatics, which is an initiative from a group of researchers in bioinformatics aiming to promote the unseminars culture in Barcelona as a tool to share our knowledge (and ignorance! ), experiences and interests around biological research and open science. 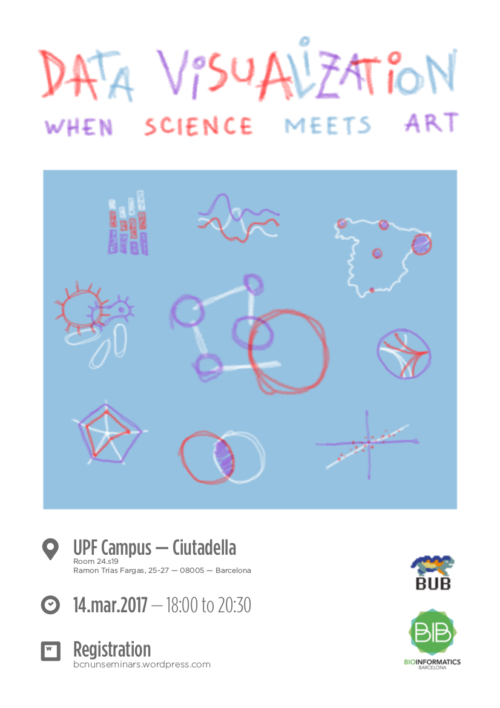 The topic of the talk was ‘Data Vizz – When science meets art’, and the aim of the unseminar was to give to researchers tools to communicate better their results and to improve how they can visualize data. For that reason we introduced concepts related to the fields of design, infographics, typography and of course, data visualization.